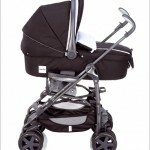 A Bassinet stroller is a comfortable choice for babies and a convenient choice for parents. Offering a traditional look and classic style, bassinet strollers have been the baby carriage of choice for new parents for the last 150 years. Historically referred to as prams, which is still sometimes used today, bassinet strollers have come a long way since their humble beginnings – with added safety features, technologically advanced wheels and mechanisms, and lightweight, portable construction. 1. If you purchase a folding portable bassinet stroller, make sure that the locking mechanisms lock and function properly in both the closed and open positions. 2. Check the stop pins that hold the seat or bassinet secure to make sure they are present, secure and straight. There have been recalls in both the USA and Australia for bassinet strollers with missing or damaged pins that resulted in instability of the bassinet. 3. If your bassinet stroller comes with a fluffy mattress or pillows, remove them and use a firm mattress pad instead. Overly soft bedding increases the risk of suffocation and should be avoided. 4. Look for bassinet strollers with a removable bassinet to be used as a baby bed when visiting family and friends or traveling. 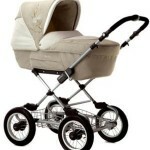 This is more cost-effective and more convenient than purchasing a separate bassinet and stroller. 5. Once you have narrowed down your choices to a few bassinet strollers with your preferred features, look for reviews online to determine which brands and styles perform best and are most popular. There are a wide variety of bassinet strollers on the market with prices that range from under $200 to well over $1,000. When selecting the right bassinet stroller for you and your baby, the most important part is finding one that provides safety and comfort for your baby, and reliability and convenience for you. Researching bassinet strollers and following the above tips will help you find the bassinet stroller that is right for you, which will make traveling, having a day out with the family, or simply running errands much more convenient and comfortable for you both. This entry was posted on Wednesday, May 27th, 2009 at 11:38 pm	and is filed under Bassinet Guides. You can follow any responses to this entry through the RSS 2.0 feed. You can leave a response, or trackback from your own site.